WASHINGTON, D.C. – Members of the Western Caucus released statements applauding the bipartisan passage of H.R. 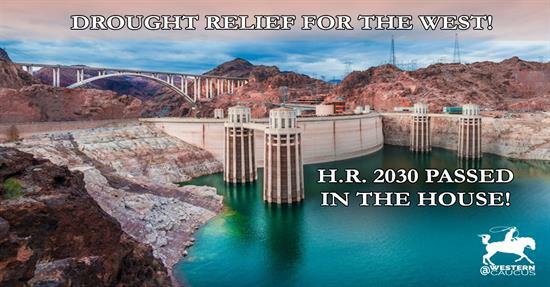 2030, the "Colorado River Drought Contingency Plan Authorization Act." Chairman Paul Gosar (AZ-04): "I applaud Reclamation Commissioner Brenda Burman and Arizona Department of Water Resources Director Tom Buschatzke for all their hard work and leadership in bringing the Drought Contingency Plan together. The DCP reduces the threats associated with Lake Mead and Lake Powell falling to dangerously low levels. In my home state of Arizona, significant harm would ensue for farmers, tribes, cities and people if the water in Lake Mead dips below the 1020 feet threshold. In recent years, we have come dangerously close to that level as drought conditions and increased water use has threatened nearly 40 percent of the State’s annual water demand that comes from Colorado River water supplies. I am very grateful to the CRIT, the GRIC, the Central Arizona Project, the Salt River Project, irrigation districts, industrial water users, as well as other water users in Arizona and the West for uniting together and making significant voluntary contributions in order to allow these historic agreements to move forward. While the DCP may not be perfect in everyone's eyes, it significantly reduces the threat of severe water shortages for Arizona and Western communities." House Natural Resources Committee Republican Leader Rob Bishop (UT-01): "With the states’ work and today’s vote, we have passed a solution that saves a river that serves forty million people, irrigates vast amounts of farmland, and encourages clean, emissions-free hydropower. I thank the Colorado Basin States for their leadership in negotiating and finalizing this plan, and Chairman Grijalva and colleagues in the House for moving quickly on this legislation. It is our hope the Senate will act quickly and send this bill to the president’s desk." Executive Vice-Chairman Scott Tipton (CO-03): "I am glad to see an effective strategy produced after years of collaboration between the seven states involved and the federal government. As the location of the headwaters for the river that supplies water to roughly 40 million people, Colorado plays an especially crucial role in the management of our most precious resource. This past winter brought much needed snowpack to the region, but there is no certainty this trend will continue in the coming years and it is important to have a contingency plan in place. Ensuring the Colorado River can meet the demands of all water users who rely on it is a shared responsibility among all Upper and Lower Basin states. The Drought Contingency Plan agreed to by the basin states will help ensure continued hydropower operations and compact compliance, and now each state must work to develop a plan for meeting the obligations of the DCP." Chief Budget Officer David Schweikert (AZ-06): "I am pleased to see this Colorado River Drought Contingency Plan Authorization Act passed through the House so we can better support our farmers, tribes, and all water users across Arizona. Even in a year of high rainfall, it is important that users of the Colorado River be responsible with water management, as Arizona has always been. The desert southwest, with our unique geography, is no stranger to drought and severe water conditions. The DCP is a great example of states working together to address extreme water challenges, without the federal government imposing a one size fits all solution." Chief Regulatory Reform Officer Andy Biggs (AZ-05): "Sustainability of the Colorado River is critical to maintain Arizona’s rapid growth and its strong agricultural economy. Arizona is in its 21st year of a long-term drought and has been able to sustain itself through this drought through implementation of successful conservation programs and robust collaboration between tribal, community, industry, and government leaders. The Colorado River Drought Contingency Plan will provide certainty to Arizonans – and to residents from the Colorado River Basin states – as to what their water security will look like for future generations. I thank all the stakeholders from Arizona for their leadership in this states-driven effort." Rep. Ken Calvert (CA-42): "The Colorado River is a critical source of water for approximately 19 million people in the southern California region. After 19 years of drought on the Colorado, Lake Mead is near critical levels. Thanks to the tremendous leadership of the seven Colorado River basin states and water users throughout the basin, the worst impacts of drought will be avoided. I applaud the work of Chairman Grijalva and Ranking Member Bishop to shepherd this legislation through the House, and I urge my Senate colleagues to take up this legislation swiftly to protect water supply reliability to southern California." Rep. Debbie Lesko (AZ-08): "The Drought Contingency Plan (DCP) is vital to the economic stability and overall future of Arizona. It took a lot of hard work to get this plan to Congress, and I am pleased to see it pass the House of Representatives with such broad bipartisan support. I am proud to support this bipartisan agreement and call on my Senate colleagues to quickly pass this bill so it can be signed into law. Arizonans are depending on it." H.R. 2030 Cosponsors include Representatives: Mark Amodei (NV-02), Andy Biggs (AZ-05), Rob Bishop (UT-01), Ken Buck (CO-04), Ken Calvert (CA-42), Liz Cheney (WY-At Large), John Curtis (UT-03), Diana DeGette (CO-01), Ruben Gallego (AZ-07), Paul Gosar (AZ-04), Debra Haaland (NM-01), Steve Horsford (NV-04), Jared Huffman (CA-02), Ann Kirkpatrick (AZ-02), Doug Lamborn (CO-05), Susie Lee (NV-03), Debbie Lesko (AZ-08), Mike Levin (CA-49), Alan Lowenthal (CA-47), Ben Ray Lujan (NM-03), Ben McAdams (UT-04), Grace Napolitano (CA-32), Tom O'Halleran (AZ-01), Ed Perlmutter (CO-07), Lucille Roybal-Allard (CA-40), Adam Schiff (CA-28), David Schweikert (AZ-06), Greg Stanton (AZ-09), Chris Stewart (UT-02), Scott Tipton (CO-03) Dina Titus (NV-01), Xochitl Torres Small (NM-02).